United Bricks: Three MinFigs get the review treatment! On parade today we have three WWII Germans from United Bricks. 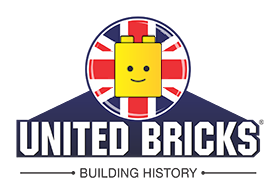 Last time we reviewed United Bricks MinFigs they passed with flying colours. Will it be the same story this time, or have they been reprimanded and put on kitchen duty peeling spuds (potatoes for those not from the UK). Read on to find out! First up we have German Soldier Corporal. 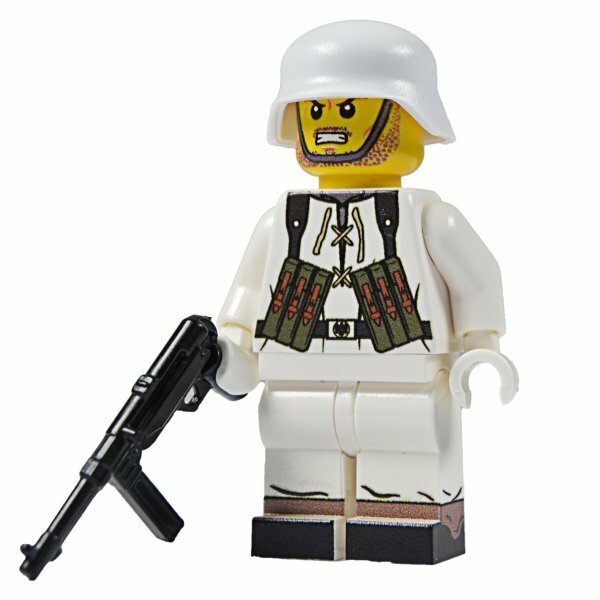 In the last review, we also had a German corporal, but that time he was wearing a light grey uniform and didn't have the MP 40 ammo pouches on his webbing. This time he is wearing the standard feldgrau (field grey) uniform. He has his corporal's rank on his left shoulder. On his head is a metallic looking German M40 helmet. 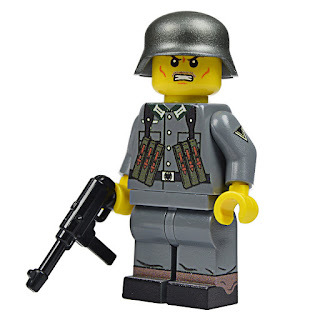 Unlike the grey uniformed corporal, this time he comes with a weapon, an MP40, hence the ammo pouches. One of my criticisms of the Cobi MiniFigs was their happy smiling faces; this is more like it, wearing his close combat face! He comes in either a yellow skin version as seen here or a more realistic light flesh version. You can also buy a winter version. Print work is excellent and I have no complaints. He retails at £8.50. Next up is a German Officer. 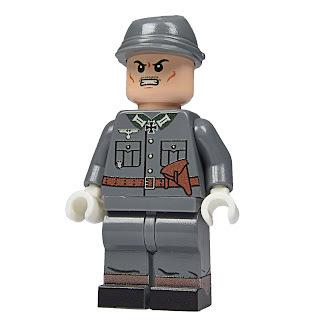 He is wearing your standard early\mid war feldgrau uniform (The pockets give the date away, late war have no pleats on the pockets) and his hat is a Lego Kepi. On his belt is his Luger's holster. He is also wearing white gloves, so I presume he is on parade rather than in action. Obviously a brave soldier, he has the close combat badge and a Knights' Cross around his neck. Skin tone is flesh rather than the normal LEGO yellow, which is more realistic and my preference to be honest. Printing is excellent - they use a high quality UV method which produces excellent results. I've saved my favourite for last. 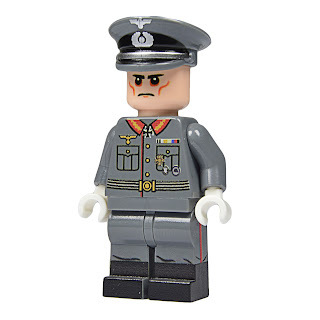 Here we have a German General. He is wearing a feldgrau German General's uniform. 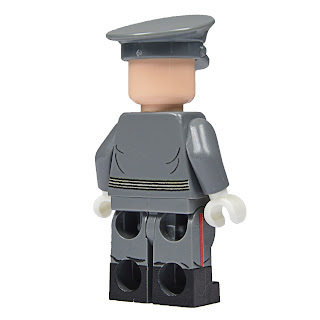 German Generals have red piping down the side of each leg. It also has red piping down the front of the jacket. He has a General's insignia on his lapels. He also has a collection of medals, including the Knights' Cross, Close Combat Badge and a War Merit Cross. On his head is a German officer's peaked cap, which I love - really well made. He wears white gloves and his skin tone is Flesh. I really do love this MiniFig. One other aspect to mention is his face, he looks extremely overworked and stressed out, with his red rimmed eyes and sunken cheeks, a great little detail. The print work is top quality. The General retails at £8.50 and is well worth the price. One final thing to mention is that the MiniFigs now come in a neat little black box with foam lining and gold printing on the lid. So much better than a zip lock bag:) This gets a huge thumbs up from me! Well that's it for now. As you can see it looks like the spuds still need peeling! Keep checking back for more Mini Fig reviews and I'm sure we will be reviewing more excellent new releases from United Bricks!